Stands are constructed with a three-point suspension to properly support your granite surface plate. All plates are marked with three suspension points on the bottom of the plate, which coincide with the three suspension points on the top of the stand. The alignment of these points will ensure the guaranteed accuracy of your plate. Stationary stands have leveling screws on the bottom of each leg. 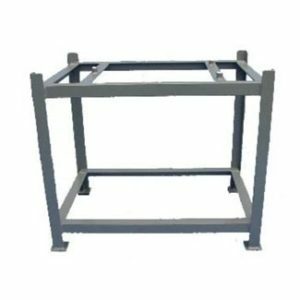 Locking Castered Stands are equipped with two swivel and two rigid casters to allow the plate and stand to be easily rolled or locked in place. The leveling bolts are located on top of the stand in the three point suspension. Stands are constructed from welded steel, with a durable gray finish to provide exceptional strength and durability. Each stand is made to a standard 36-inch working height, unless otherwise specified.